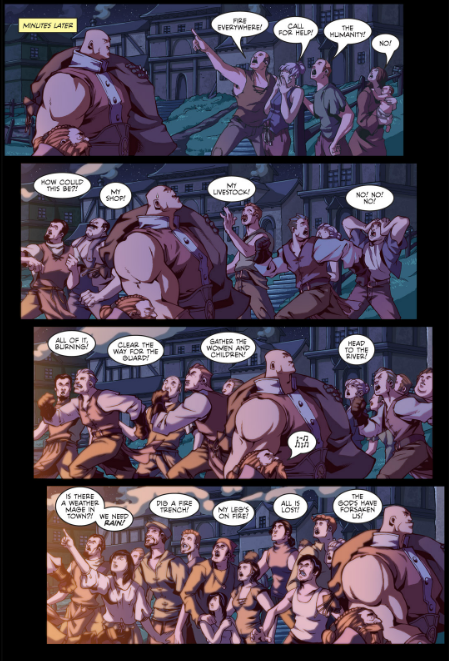 Today, we’re talking about Skullkickers by Jim Zubkavich and Edwin Huang. Skullkickers, to quote Ranier Wolfcastle (star of McBain: Let’s Get Silly), is “a mix of action und comedy,” with a bit of fantasy and horror thrown in. That’s four genres, people! Four genres for your valuable moneys! Skullkickers (are you getting that I love typing this title?) stars “Baldy” and “Shorty,” a pair of monster killers for hire. They inhabit a world set in medieval times, filled with monsters, but everyone talks like they’re in an 80’s action movie (Note: This is a GOOD THING, as the 80’s were the golden era of action movies. This dialogue gets 3.5 Shane Blacks out of 5 Shane Blacks). Zubkavich and Huang do very well together in marrying the four genres, though comedy is their priority. The above page conveys the hilarity of our heroes escaping the flaming scene of a crime with the same casual tenseness of a Simpsons “I left your present in the car” gag. Allow me to explain, without the aid of asterisk OR parenthesis, The Simpsons “I left your present in the car” gag. Often, a negligent character, like Homer J. Simpson, will have forgotten to buy a present for his wife, or one of his children. Upon being reminded of the birthday, anniversary, etc., he will then say that the present is…in the car…yeah, with appropriate hesitation and pauses, for comedic effect. The rest of the gag is pulled off via off screen audio, as we hear him slam the door, run to the car, start the car, and drive it away quickly. To see it in action, please view “Treehouse of Horror III,” which is in the fourth season of The Simpsons. Anyway, I’m not diving deep into what the creative team is doing. They are quite simply creating a fun comic. They are also crafting a quality comic. Often “Fun” is used as an excuse for why something is crappy. It doesn’t have to be good, because it’s “dumb fun.” NO. The characters may not be smart. They may engage in some pretty dumb activities. But the comic isn’t dumb. 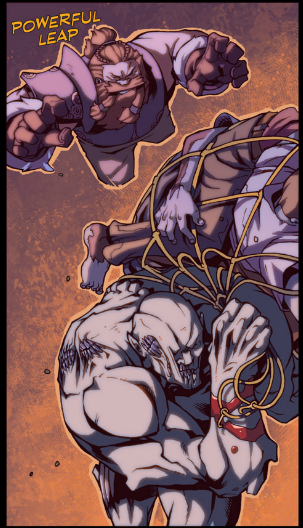 Skullkickers is just FUN. Read it. You’ll get to see a dwarf and a big bald guy fight monsters, jerks, and more monsters. Skullkickers is published by Image Comics, you can purchase it on Comixology, Amazon, or your local comic or book store. Do not buy it from the guy offering you a signed CD in Times Square. He is a scam artist. He does not have any comic books. Hey Paul, What Should I Read?